Our latest REVOLVING BOOK is by MINNETTE MEADOR! Marius is disciplined, precise, as cold as his armor. A twenty-five year veteran, the Centurion is dedicated to the principles of Rome. No one had ever dared to challenge his command… until now. Queen Delia struggles to save her dying Celtic people, fight to lead in a world dominated by savage men. The last thing she expects is to feel her body craving the touch of an enemy. The revolution that sparks their desire rips her from his arms. They find themselves on opposing sides, in love, and unable to stop the future. FALLEN ANGEL REVIEWS – Minnette Meador adeptly weaves in Roman and Celtic words and references, adding realism to this harsh world. 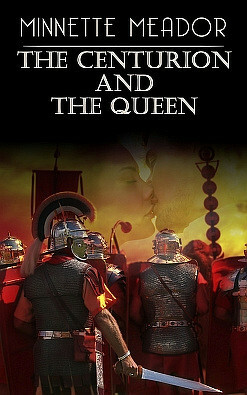 Fans of The Centurion and the Queen will not be disappointed. AUTHOR BIO: Somewhere between thirty and dust…red hair, blue eyes…six kids, one slightly used husband, and any number of pets from time to time… wannabe hippy… wanttheirmoney yuppie…pro musician and actress for 20 Years… native Oregonian… lover of music, beauty, and all things green. Willing slave to the venerable muse. Minnette currently resides in Portland, Oregon with her husband, having replaced the children with one dog. The dog, Pierre, pretty much runs the show. EXCITING ANNOUNCEMENT: Coming out September 7th, THE GLADIATOR PRINCE, third book in the Centurion Series. I will be going on a month long blog hop and giving away, jewelry, Roman memorabilia, Celtic trinkets, and as a grand finale, a Kindle to one lucky commenter. If you’d like to join my mailing list, just drop me a note at mmeador@minnettemeador.com and I’ll make sure you get a reminder! It had snuck up her back unexpectedly as he was speaking; watching his stormy dark eyes, his lined rugged face, and the way he held himself on the back of the horse. The fear did not come from his words, his manner, or his stance. It came from a deep, overwhelming desire stirring within those smoky eyes. She never felt anything with such intensity before, and despite her valiant effort to control it, she trembled. Delia found herself infatuated with this Roman, and the thought sent a shiver of disgust through her. The centurion blinked at her and the faintest trace of a smile appeared. The only other movement on his face was a slight flare of his nostrils. “No?” he whispered. The soldiers edged their mounts away from him. “Perhaps, sir, we should invite the lady…” Aelius said quickly. A single glance from the centurion silenced the man. Marius leaned down against the neck of his horse as it again tried to bite her. Delia stepped back irritably and glowered at the animal. “No one could accuse you of not being precise, Centurion,” Delia answered sardonically, then quickly lowered her head and took a deep breath. He sat up with an air of self-assured satisfaction and looked down at her, apparently intending to press his authority and his advantage. Obviously, this was something the centurion expected: obedience, supplication—control. But all at once, Marius stopped. For several heartbeats, his eyes softened and Delia could feel a ripple of excitement run through her when the shade of a smile touched his lips. The centurion quickly cleared his throat and took a deep breath. “Very well,” he said, the coolness returning to his face. “You and the girl will come with us, so we can see to your injuries and then we will discuss your men. It is nearing the evening meal. If you will dine with me, we can pursue it. Is that acceptable?” He reached down to take her hand. Delia appeared outwardly calm, but inside she was a raging chaos of conflicting emotions. Her heart told her to take his hand, enjoy his warmth, his touch, to melt into his arms and surrender to those amazing eyes. The scent of the horseflesh, leather, the soldiers, and the forest mingled, making her head swim. She could hear a voice inside screaming vehemently to run in the opposite direction. Her heritage was appalled that Delia would even consider it—she could hear her father’s voice swearing behind her ears. But it was her duty, in the end, that won out. She had a responsibility to her people. The centurion smiled, and she found herself wanting to yield to it. Delia bit her lip to keep it from trembling. “Please,” he said awkwardly as if it was a word he seldom used. With a soft nod, she took his hand—the heat of it shot lightning down her arms and legs—and allowed him to pull her up behind him.